Interested in the Post Office Horizon story? Want to know the outcome of the first trial? Don't fancy reading all 180,000 words of the judgment? You've come to the right place. Hang on - I don't know anything about this story. Ah - go to the bottom of this post, read the "Backgrounder", then come back. Quick, now. What is this judgment, then? 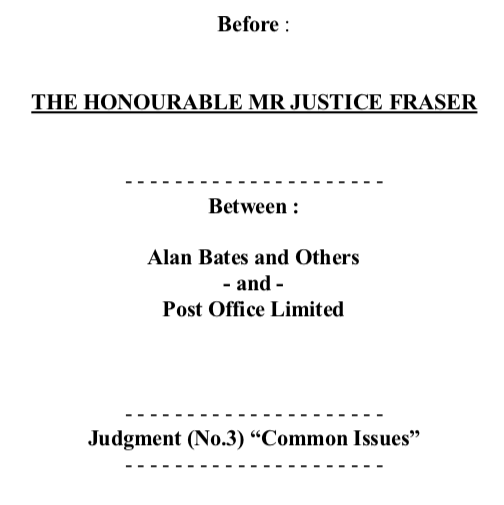 It was handed down on 15 March 2019, and it is the judgment to the Common Issues trial in the Bates and others v Post Office High Court group litigation. Bates and others are a group of 550+ former Subpostmasters and branch post office assistants who have been made to pay money (or worse) to the Post Office in disputes over balances and trading statements generated by the Post Office's accounting and point-of-sale counter IT system, Horizon. Why is it the third judgment in this litigation? I thought it was the first trial? It is. There were two (much shorter) pre-trial judgments. One followed a disclosure hearing, the other was a strike-out application. The Post Office lost those, too. A list of 23 issues relating to contractual relationship between the Post Office and its Subpostmasters which both the claimant Subpostmasters and the Post Office's legal teams agreed needed sorting out. The judge was asked to make findings on each of those issues so the obligations between Subpostmasters and the Post Office under all post-Horizon iterations of the Subpostmasters' contracts would be settled - both going forward and retrospectively. A trial of a contract? How does that work? It wouldn't work without having some claimant and Subpostmaster witnesses who could explain to the court how the contract was enforced in the real world. So that's what happened. 14 Post Office witnesses were called and six claimants were chosen from the 550 - three by the Post Office and three by the claimants. The rest of the trial was taken up with legal argument over contract law. "these submissions by the Post Office are bold, pay no attention to the actual evidence, and seem to have their origin in a parallel world. It is unclear to me how someone can be expected to ask for a copy of something that they do not know exists." "It does appear to me that the Post Office in particular has resisted timely resolution of this Group Litigation whenever it can, and certainly throughout 2017 and well into 2018." "the Post Office seemed to want findings on that only if they were in the Post Office’s favour. This is a peculiarly one-way approach by any litigant." "The Post Office seemed to adopt an extraordinarily narrow approach to relevance, generally along the lines that any evidence that is unfavourable to the Post Office is not relevant." "Mr Beal was completely unrealistic... [his] way of giving evidence was very much the house Post Office style, certainly for the more senior of its management personnel who gave evidence. This was to glide away from pertinent questions, or questions to which the witness realised a frank answer would not be helpful to the Post Office’s cause." "Mr Breeden is articulate, intelligent and also acutely aware of how much the reputation of the Post Office hinges on these proceedings. His evidence was presented in terms obviously designed to put the best possible gloss for the Post Office on matters, and some of his statements simply did not stand scrutiny." On Post Office director Angela van den Bogerd: "she did not give me frank evidence, and sought to obfuscate matters, and mislead me." On Post Office Retail Transformation Integration Manager Timothy Dance: "His witness statement contained statements about matters of which he had no knowledge whatsoever." On Post Office Security Team Leader Helen Dickinson suggestion she had never heard of the Enron fraud case: "Mrs Dickinson is a fraud specialist and it is simply inconceivable that she was not familiar with the Enron case, at least in outline terms. I reject her evidence that she did not know about Enron, which I find incapable of belief. The only reason to claim ignorance, as she did, was simply to be unhelpful, which is what I find she was being." "the Post Office doesn't tend to focus on the precise words of a contract, it knows what its interpretation is and that is what everyone works to. This could be described as the Post Office method of contractual construction." "This is yet another example of documents produced and used by the Post Office being incorrect and consisting of reference to archaic items which no longer existed." "The Post Office appears, at least at times, to conduct itself as though it is answerable only to itself. The statement that it is prepared to preserve documents – as though that were a concession – and... to refuse to produce them, is extremely worrying. 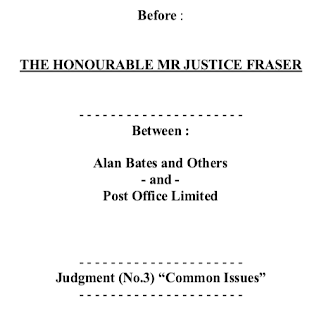 This would be a worrying position were it to be adopted by any litigant; the Post Office is an organisation responsible for providing a public service, which in my judgment makes it even worse." "it was expressly submitted by the Post Office – and also put to some of the Lead Claimants – that a Subpostmaster did not have to accept debts with which they did not agree at the end of a branch trading period. That proposition is plainly incorrect in fact." "[There is a culture] of excessive secrecy at the Post Office about the whole subject matter of this litigation. They are directly contrary to how the Post Office should be conducting itself." "If one wished to become a Subpostmaster, then it was the Post Office’s terms that were available, and those terms alone. There was no negotiation permitted whatsoever.... The two parties are not remotely equal. In fact, they are almost uniquely unequal." What did the judge think of the claimant witnesses, then, eh? He accepted all their evidence. And he added: "there is a lot to be desired from the Post Office’s behaviour as identified in the cases of the Lead Claimants"
So the claimants won, then? 1) If a Subpostmaster contacts the helpline to dispute Horizon's figures in any given trading period, then the Branch Trading Statement they are required to sign off before rolling into the next trading period cannot have the status of a "settled" account. "The issue of a Subpostmaster as an agent deliberately rendering a false account to his or her principal, in relation to any such Branch Trading Statement for such a period therefore simply does not, in my judgment, arise." Rather important when you consider the number of prosecutions for false accounting. "It is not for a Subpostmaster to demonstrate that there was no negligence, carelessness or error on his or her part. It is for the Post Office to demonstrate that there is." If the Post Office has ever suspended, sacked or prosecuted a Subpostmaster without first demonstrating the above, it is now on very shaky ground. i) The clauses in the NTC contract which hold the Subpostmaster strictly liable for any negative discrepancies in their branch accounts for any reason (save a robbery), or any negative discrepancy discovered in the Subpostmasters absence. ii) The clause in both contracts which allows the Post Office to suspend Subpostmasters without pay without giving good reason. iii) The clause which allows the Post Office to "terminate" (ie sack) a Subpostmaster for any breach of contract, no matter how small. iv) The clause in the SPMC which allows the Post Office to terminate a contract with three months notice, without giving a reason. v) Clauses in both contracts which do not entitle a Subpostmaster to any compensation in the event they are terminated. 4) Finally, the judge found Subpostmasters' contracts are not strict agency/principal or business-to-business contracts, they are relational contracts. As per the judgment: "This means that the Post Office is not entitled to act in a way that would be considered commercially unacceptable by reasonable and honest people." 1) The Post Office can't point to a discrepancy between a Horizon-generated balance and the amount of cash and stock in a branch and tell the Subpostmaster to make it good. It has to prove it was made by the Subpostmasters' "carelessness, negligence or error." 3) Subpostmasters cannot be held liable for disputed Branch Trading Statements. 4) The Post Office cannot act unreasonably and can be held liable for doing so. The court is due to hold a breach trial later in November. If the Post Office is found to be in breach of any or all of the above terms, it is in breach of contract and acting unlawfully. With the above situation as its starting point, most or all of the litigants' claims will likely succeed. No - the Post Office has announced it intends to appeal the judgment and is trying to have the judge sacked on grounds of bias. Yes. Let's see what happens next, shall we? And thanks for reading this far. The reporting of this litigation has been crowdfunded. If you can spare a few quid, please scroll to the tip jar at the bottom of this post. Many thanks. Subpostmasters use an accounting and Electronic Point of Sale system called Horizon. You will see a Horizon terminal sitting on the counter of every single Post Office in the country. Every transaction at every branch goes through Horizon. At the end of each month, taking into account all these transactions, Horizon tots up exactly how much cash and stock should be in each branch. It presents that figure to each Postmaster to sign off as a settled account to the Post Office. If the figures on the Horizon screen do not match the amount of cash and stock in branch, Postmasters have to make up the difference with their own money. The Postmaster might be certain, from their own record-keeping and internal investigation, that there is a problem with Horizon's figures, rather than a problem in their branch, but the Postmaster has no right to any investigation of the Horizon system. Postmasters are therefore responsible for their branch accounts, but not in control of them. The Post Office's current approach is to initiate debt recovery proceedings against Subpostmasters on notification of a discrepancy which isn't made good immediately. Postmasters who have disputed discrepancies have often been told they have no choice but to make them good (either immediately, via a payment plan or out of their salaries), no matter how large the sums involved. Some have refused and been sacked, losing their source of income and instantly devaluing their attached retail businesses. Some have made good at crippling personal expense. Some of those Subpostmasters who shovelled thousands of pounds of their own money into Post Office tills to balance their discrepancies found the discrepancies returned. Out of ignorance, desperation and extreme duress, knowing the Post Office would just treat a further inexplicable discrepancy as a further debt, some Subpostmaster accepted the Horizon-generated cash and stock figure on their screens as a correct reflection of the cash and stock in their branches when it wasn't. 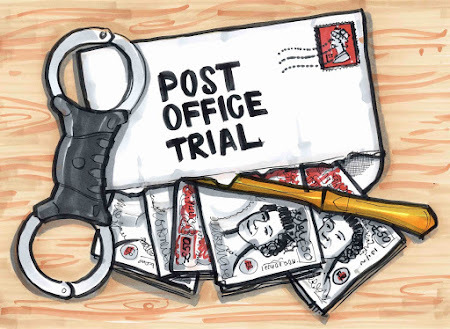 Why have so many Subpostmasters been sent to prison? Postmasters having difficulties or flagging large discrepancies or problems with Horizon would often be "audited" and if a cash/stock discrepancy was fond they would be suspended without notice or pay. Some would be "investigated" by Post Office staff and sacked. Some would be prosecuted for theft and false accounting. Many of those prosecuted for theft and false accounting were naïve and badly advised. Some were advised to plead guilty to reduce a potential prison sentence. Some lawyers would negotiate dropping a theft charge in return for a guilty plea to false accounting. Once a guilty plea had been secured, the Post Office could apply for a proceeds of crime act order against their former Subpostmaster for the value of the Horizon-generated discrepancy. Live savings were taken. I have spoken to quite a few former Subpostmasters dragged through the criminal justice system on this basis. They have horrendous tales to tell. How did this end up at the High Court? In 2016 after more than a decade of campaigning, Alan Bates, a sacked Subpostmaster and founder of the Justice for Subpostmasters' Alliance, got funding to start a legal action against the Post Office at the High Court. He wanted redress (and damages) for himself and fellow Subpostmasters who claimed they had suffered at the hands of the Post Office. The Post Office has said in court documents "If the Claimants were right in the broad thrust of their case, this would represent an existential threat to Post Office’s ability to continue to carry on its business throughout the UK in the way it presently does." They are right. As a result, they are fighting it tooth and nail, with their bottomless pockets of taxpayers' cash. The hope is that the claimants' will eventually run out of money. Surely if the Post Office were that bad an outfit, the government would have stepped in long ago? The government owns the Post Office, but it is known as an ALB - an Arms Length Body. That means successive Ministers for Postal Services have left it well alone. The Cabinet Office is meant to oversee the relationship between the government and ALBs and a senior civil servant sits on the Post Office board. As far as I am aware, no government department has ever scrutinised the Post Office's behaviour over Horizon, its mass suspensions and sackings and its prosecutions of Subpostmasters for Horizon-based discrepancies. Why aren't the unions shouting from the rooftops about it then? The judge's damning comments on the Subpostmasters' "union", the National Federation of Subpostmasters, is worth a blog post to itself, so I have written one here.